Feast of SFB Festival/ Donations & Volunteer Sign Up! 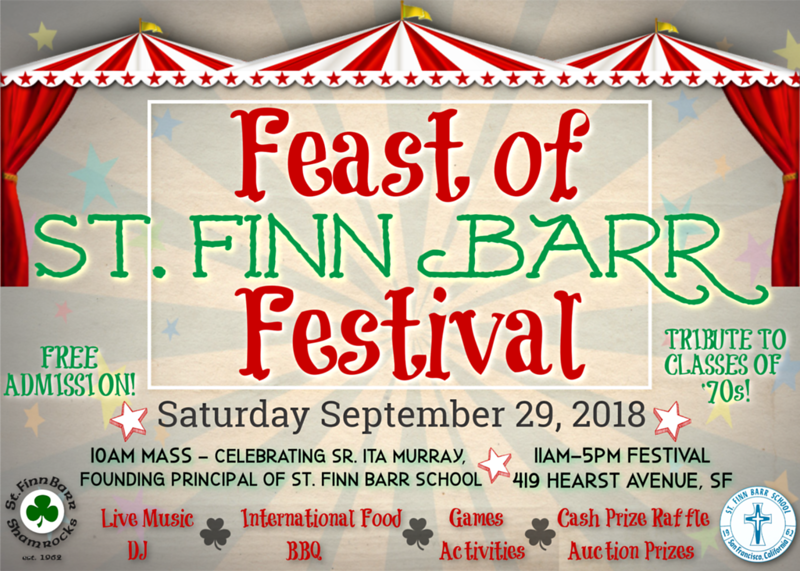 We hope you have all saved the date for this year's Feast of St. Finn Barr Festival! Saturday, September 29th - we'll kick off our celebration with a mass at 10:00 AM. The festival begins at 11:00 AM and includes live music, a DJ, BBQ, international food, bingo, a cash raffle, auction, and an assortment of games and activities. Some of the games and activities will be new to this year and our photo booth will be available at no cost to our festival goers. As with previous festivals, we are dependant on the generosity of our community to help with volunteering and donations. Below are links to sign-up for volunteer positions as well as donations. These sign-ups will be updated, but if you have any questions, please do not hesitate to contact Eric Klosterman at festival@stfinnbarr.org. A pre-order ticket form will be sent home this week, but it is also attached below for your convenience. Please send to the school office with my attention, Eric Klosterman, no later than Friday, September 21, 2018. Tickets will be sent home with oldest child on Tuesday, September 25, 2018. As always, thank you for your support. It goes a long way towards helping our school and parish.